Leah Coffman is our Full-time Police Corrections Officer. Leah began her employ with the City of Macedonia as a Full-time Dispatcher in 2015. 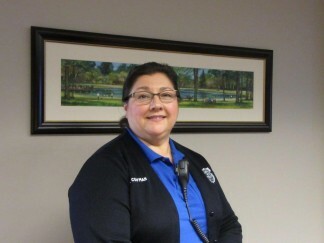 Prior Leah worked as a full-time dispatcher in Sagamore Hills. Leah enjoys working in the Police Department as her job entails diversity and adds a component of safety for the community. Some of the Corrections Officer duties include; maintain security and oversee the health and safety of staff and prisoners. Receive prisoners into custody and release. Prepare necessary documents and filing. Obtain and deliver meals 3 times a day. Performs hourly cell checks. Monitors all inmates in order to respond immediately to needs/emergencies and to call for security support if needed. Monitors behavior or any abnormal activity. Macedonia jail is a short-term 12-day facility. The average prisoner stay is 5 to 10 days. Leah attended the Corrections Training School at Tri-C where she received her certification. Leah has been married for 27 years to her husband Ron. Leah has a 21-year old daughter, Lydia and a 12-year old son, Scott. Scott is actively involved in 4-H a premier youth development program of the U.S. Department of Agriculture. Leah and her family reside in Northfield Center where she has chickens, ducks and a hog. Her family enjoys camping, boating, water sports and weekend trips at the Berlin Reservoir. We thank Leah for her dedication and congratulate her on this Award and being part of the Macedonia Team!